Franklin reminiscences when he was a small boy and paid too much for a whistle. He sure did learn how to strike a bargain, though. His letter was excerpted from a collection published in 1914, The Oxford Collection of American Essays, chosen by Branther Matthews. I am charmed with your description of Paradise, and with your plan of living there; and I approve much of your conclusion, that, in the meantime, we should draw all the good we can from this world. In my opinion we might all draw more good from it than we do, and suffer less evil, if we would take care not to give too much for whistles. For to me it seems that most of the unhappy people we meet with are become so by neglect of that caution. You ask what I mean? You love stories, and will excuse my telling one of myself. As I grew up, came into the world, and observed the actions of men, I thought I met with many, very many, who gave too much for the whistle. When I saw one too ambitious of court favor, sacrificing his time in attendance on levees, his repose, his liberty, his virtue, and perhaps his friends, to attain it, I have said to myself, This man gives too much for his whistle. If I knew a miser, who gave up every kind of comfortable living, all the pleasure of doing good to others, all the esteem of his fellow-citizens, and the joys of benevolent friendship, for the sake of accumulating wealth, Poor man, said I, you pay too much for your whistle. When I met with a man of pleasure, sacrificing every laudable improvement of the mind, or of his fortune, to mere corporeal sensations, and ruining his health in their pursuit, Mistaken man, said I, you are providing pain for yourself, instead of pleasure; you give too much for your whistle. If I see one fond of appearance, or fine clothes, fine houses, fine furniture, fine equipages, all above his fortune, for which he contracts debts, and ends his career in a prison, Alas! say I, he has paid dear, very dear, for his whistle. When I see a beautiful sweet-tempered girl married to an ill-natured brute of a husband, What a pity, say I, that she should pay so much for a whistle! In short, I conceive that great part of the miseries of mankind are brought upon them by the false estimates they have made of the value of things, and by their giving too much for their whistles. Yet I ought to have charity for these unhappy people, when I consider that, with all this wisdom of which I am boasting, there are certain things in the world so tempting, for example, the apples of King John, which happily are not to be bought; for if they were put to sale by auction, I might very easily be led to ruin myself in the purchase, and find that I had once more given too much for the whistle. Adieu, my dear friend, and believe me ever yours very sincerely and with unalterable affection. Enjoy reading Nathaniel Hawthorne's short story about Benjamin Franklin, and other biographies in our collection, Biographies for Kids. 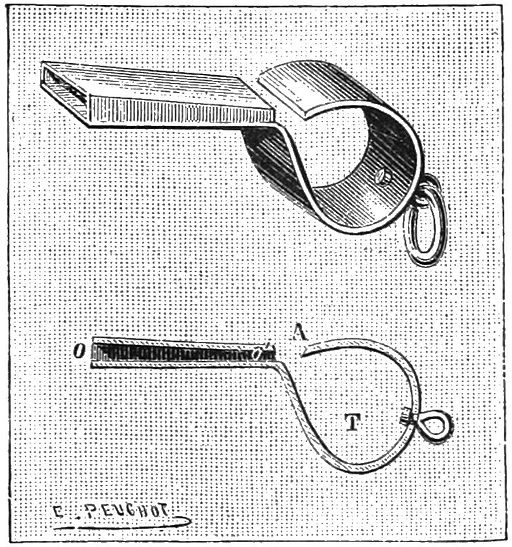 Add The Whistle to your own personal library.